The Saxifrage 3 axis Mini CNC machine is a small, solid 1610 CNC using GRBL firmware and OpenCNCPilot control software. It is specifically for milling prototype PCBs. 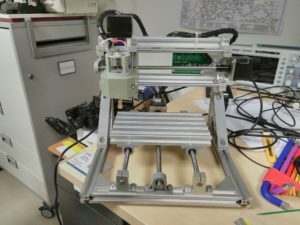 Dimensions: This machine can work with PCBs up to 160 x 100 x 1.6mm. Materials: PCBs – milling the copper layer. It is technically possible to engrave wood and plastic. This is a light duty machine. Toolchain: Anything generating G-Code suitable for GRBL should work.